In less than eight months, humanity has exhausted Earth's budget for the year. In 2018, Earth Overshoot Day fell on August 1. Earth Overshoot Day marks the date when humanity has exhausted nature’s budget for the year. For the rest of the year, we are maintaining our ecological deficit by drawing down local resource stocks and accumulating carbon dioxide in the atmosphere. We are operating in overshoot. 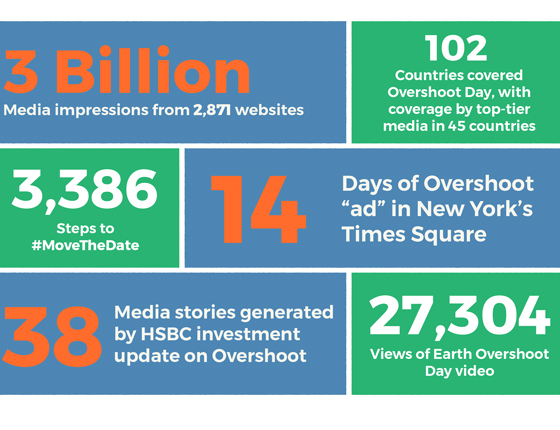 2018 was an exceptional year for building the momentum to #MoveTheDate of Overshoot Day! 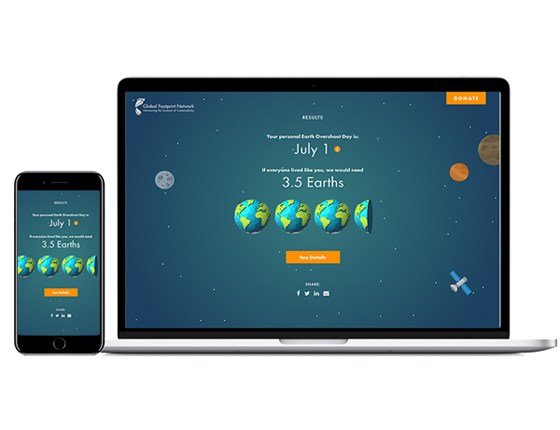 Use our mobile-friendly calculator (now available in six languages) to measure your Ecological Footprint, determine your personal Earth Overshoot Day, and learn about solutions so we can all tread more lightly on the Earth. Earth Overshoot Day is an estimate, not an exact date. It’s not possible to determine with 100 percent accuracy the day we bust our ecological budget. Adjustments of the date that we go into overshoot are due to revised calculations, not ecological advances on the part of humanity. As Global Footprint Network methodology changes, projections will continue to shift. But every scientific model used to account for human demand and nature’s supply shows a consistent trend: We are well over budget, and that debt is compounding. It is an ecological debt, and the interest we are paying on that mounting debt—food shortages, soil erosion, and the build-up of CO₂ in our atmosphere—comes with devastating human and monetary costs. For media inquiries, contact Communications Manager, Amanda Diep (media@footprintnetwork.org).